With a well maintained fleet of six roll off trucks and hundreds of containers, we can provide a container to meet any job you have. Demolishing a home or business can be an intimidating task. Relax and let Marks Demolition & Environmental Group handle the whole process for you with our professional demolition services. Marks Clearing & Grading also has dump trucks and is equipped to haul a wide variety of materials. We also offer by the hour dump truck rentals. Marks Clearing & Grading, Inc. is a family owned company that provides top-notch land clearing services, roll-off container rentals, dump truck hauling services, and demolition to customers in Augusta, GA and all throughout the CSRA (Richmond, Burke, Columbia, Jefferson, McDuffie, & Aiken Counties). 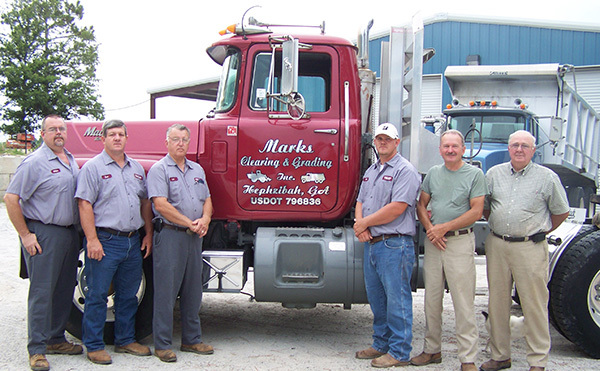 With three generations actively involved in the day-to-day operations of the company, Marks Clearing & Grading strongly believes in maintaining a “customer first” mentality by consistently providing excellent customer service and promoting ethical business practices. No matter which service you need, we are fully insured, bonded and licensed for your protection.